What Got Hit Among U.S. Stock Funds? When stocks hit an air pocket this week, as is often the case, hardest hit were the corners of the market that had been leading the charge higher. 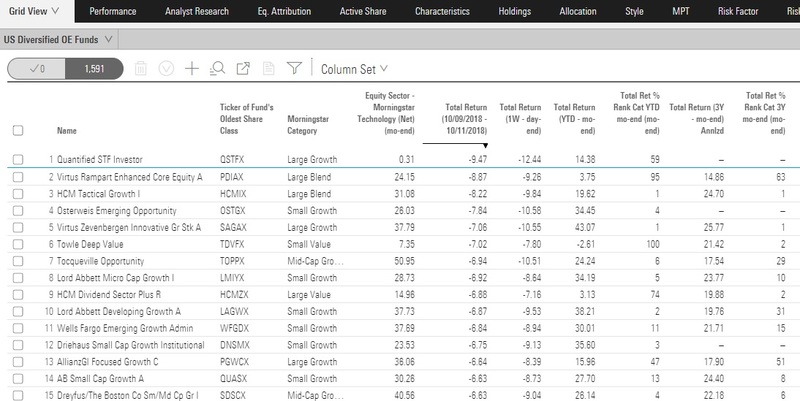 In this case, it’s been mutual funds focused on growth stocks that have taken it on the chin, especially those loaded up with shares of technology companies. Also suffering larger losses were a number of exchange-traded funds employing momentum strategies. However, ETFs with dividend strategies weathered the storm relatively well. 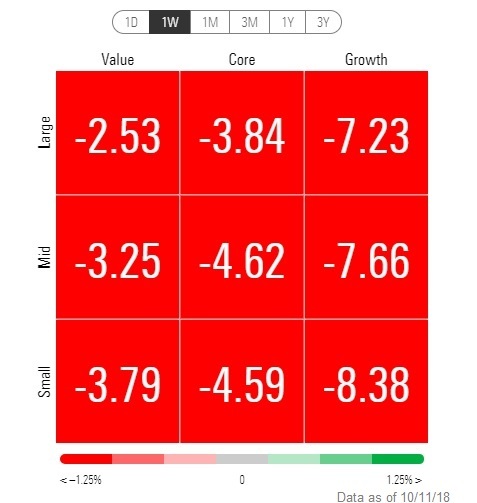 We’ll look through the market turmoil with data and tools from Morningstar Cloud. 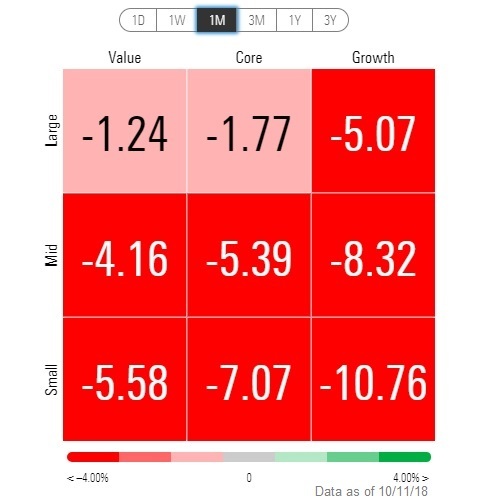 While the damage was worse among growth stocks, value – which has been lagging behind in recent years – has also been caught up in the sell-off. 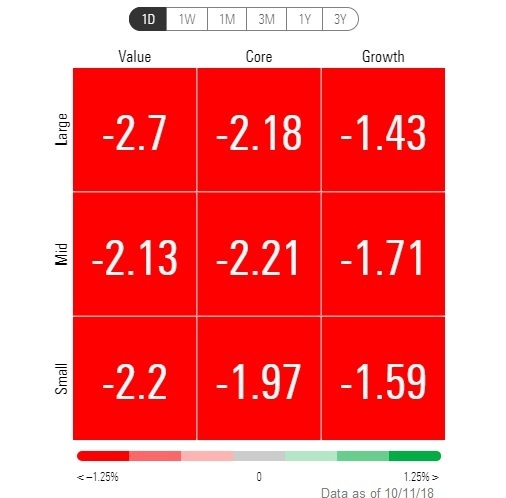 And for the past month, small growth’s losses have hit correction territory. Although on Thursday, it was actually value that fared the worst. The primary culprit has been the technology sector, although industrial and basic materials have suffered big losses amid concerns about rising interest rates and the impact of the trade war with China. Through the end of September, small growth had been up in the neighborhood of 25% over the last twelve months, and large growth wasn’t far behind. With the downdraft those returns took a haircut. But by historical return standards, those categories are still posting big gains for the past year. Diving down into the damage done among U.S. diversified stock funds, many – but not all – of the worst performing funds during the two-day downdraft were funds that had been top performers year-to-date through the end of September. For all the screens in this article we have culled out funds with assets under management of less than $100 million. Looking at the list of worst-performers, for the most part, a common denominator are significant stakes in technology stocks. (At the end of September, the S&P 500’s tech stock weighting was 21%). 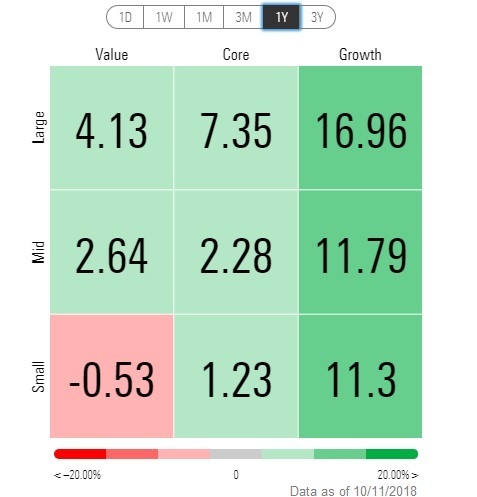 None of the funds on this list carry a Morningstar analyst rating of Gold, Silver or Bronze, and only three – Lord Abbett Developing Growth, AllianzGI Focused Growth and AB Small Cap Growth are rated neutral by Morningstar analysts. And on the winners side (at least on a relative basis) the more bouyant funds were those who have been lagging so far in 2018, including Gold-rated Yacktman and Silver-rated Royce Special Equity. Here’s a look at the damage among Small Growth. Among those hardest hit was Gold-rated Brown Capital Management Small Company, Silver-rated Baron Small Cap and Bronze-rated Fidelity Small Cap Growth. Three other funds carry Neutral analyst ratings. Turning to exchange traded funds, again the common denominator for the most part is the big technology stake. Notably, a number of momentum strategies appear to have been caught wrong-footed by the turn in the market. Meanwhile, dividend ETFs were buoyed by their utilities and consumer defensive sector stakes, and relatively low tech weightings.